This dish is Italian-inspired comfort food at its finest. It's a long recipe, but the results are well worth the effort. Although the concept is simple, it's largely made from scratch. You could certainly substitute more pre-packaged ingredients, but the result won't be the same. Trim any excess fat from the chicken thighs. Season both sides of the chicken evenly with the garlic salt and the black pepper. Set aside and let sit 30 minutes at room temperature. 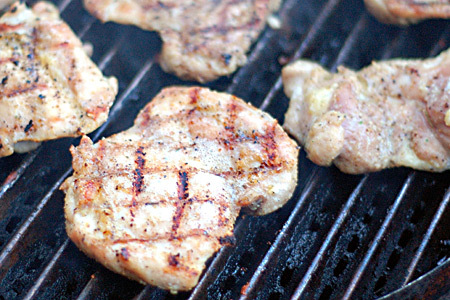 Start your grill and prepare for direct cooking at medium-high heat (400-450º). Cook the pasta per the package directions until it is just shy of al dente, then drain it well. Note: You want the pasta a little underdone because it will finish cooking when it's baked. While the pasta is cooking, brush the chicken with one tablespoon of the canola/vegetable oil and grill it over direct heat for three minutes per side. Remove the chicken to a plate and set aside. 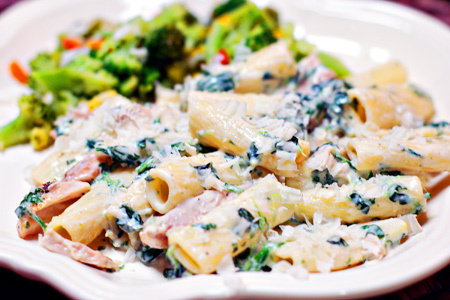 Pour the thawed spinach on top of the draining pasta and stir to allow it to drain simultaneously. Preheat your oven to 350º. Heat a large sauce pan over medium-high heat. Add the butter and the other tablespoon of canola/vegetable oil and let heat 30 seconds. 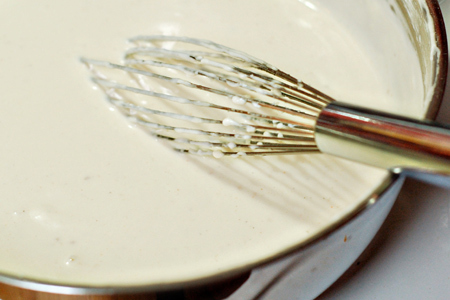 Add the flour and whisk constantly to make a roux. You want a blonde roux, so cook it until it just starts to give off a nutty aroma. Add the cream to the pan and bring just to a slight boil, whisking constantly. Add the milk, salt, garlic, white pepper, cayenne and nutmeg to the pan and bring back to a slight boil, whisking constantly. Add the cheese and sour cream to the pan and bring it back to a simmer, whisking constantly. Remove the sauce from the heat. Note: The sauce will be a little thin, but that's intentional, as it will thicken when baked with the pasta. 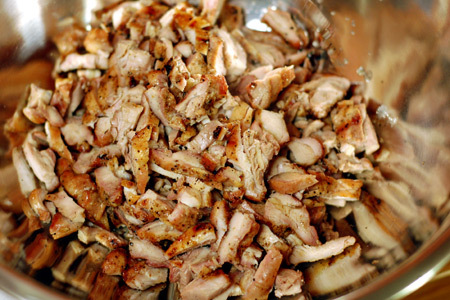 Slice the chicken to 1/4" and add put it in a large mixing bowl. 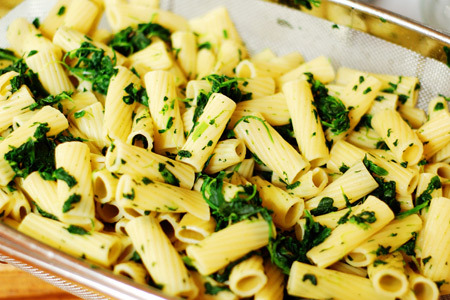 Add the pasta and spinach to the bowl. Add the sauce to the bowl and fold to combine all of the ingredients. 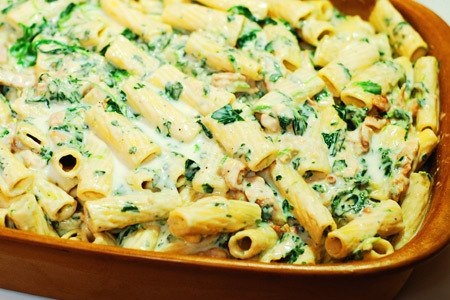 Pour the pasta mixture into a very large baking dish. Cover the baking dish with foil, and bake 40 minutes. 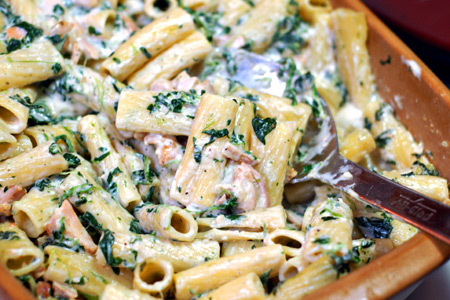 Plate the pasta with shaved Parmesan. Looks pretty stellar! So what's the diff between garlic powder and garlic salt? Same thing? OMG - this looks fantastic! I am going to have to try this! after I run 1000 miles on the treadmill, but I think it will be worth it! um YUM!!! what time is dinner? I am coming over! Ohhhhh snap. I'm snowed in with my family in Tulsa right now, but luckily we have most of these ingredients. I know chicken tenders won't be exactly the same, but from the looks of it we won't be out for a while, so I'll just forge ahead! Sounds delicious and looks awesome! Can't wait to try it. The pictures are so delicious that I have to try to make this one myself. Thanks. John; I'm making this tonight for dinner. I always get complements or win trophies with your recipes. John; I'm making this tonight.I always get complements or win trophies with your recipes. Just made this tonight! So good! Thanks for sharing! I made this recipe earlier this week. It was so delicious... I took the leftovers to work and everyone agreed that this was great. Everyone was asking me for your recipe... even the guy who "hates" pasta. I made this tonight and it was beyond outstanding. Fabulous job! Thanks for the post! How about just spinach, farfalle and Gorgonzola cheese and a few slices of Baloney (Bologna sausage) on the side. I do the same with rigatoni when I grill the Gorgonzola on top. There are two types of Gorgonzola one being called vecchio (old) which is a bit tastier. I just put this in the oven. I'm so excited! I seperated it into two casserole dishes for two different dinners since there are just two of us. Hope it's okay in the fridge till tomorrow. The house smells amazing! Can't wait! Big hit! Very tasty. Wouldn't recommend pairing it with more than a salad because it's very very filing. This looks sooo yummy. I can't wait to try this recipe. Thank you for posting this. I made this for dinner tonight & it was a BIG hit!! I made it a two day process because I grilled the chicken yesterday to make today's process a little faster. After trying it, I think chicken from a rotisserie chicken would work just as well. I also added sauteed mushrooms (just thought it sounded good). Everyone thought it was excellent & I will definitely make it again. This would even be good for a pot luck dinner. does anyone know if you can freeze this and at what stage you would do so? Anonymous - Yes, you can certainly freeze it. Just cook it, cool it, and freeze it like you would a lasagna. Will cutting all the ingredients in half yield the same goodness? Looks delish I think I will make for dinner tonite. I know it won't be as rich or wonderful using milk instead of cream, but would it hold together okay if I substitute? Di - I don't know if milk will cause a problem, but it seems like it might be a litte soupy. Give it a try. I made this last night and it was absolutely delish! I made this a few months ago and now I'm returning to make it again!! It was delicious!!! One of my favorite meals! Yum.. this looks delicious. Thinking about making this tonight or tomorrow night. I just need enough for 2, so I'm thinking I can half the recipe. thoughts? Sandi - Well, the recipe makes 15 large servings, so you'd have to cut it by far more than half for two servings.